The July long weekend is always busy at my house because it's when we get the kids ready for camp. This year they'll be away for six weeks without any parents, homework, city pollution, cell phones, TVs or computers. They are off the grid at camp. I love knowing this. Summer camp, kid trackers, crazy New York parents and toddlers gone mad...that's what caught my attention this week. The July long weekend is always busy at my house because it's when we get the kids ready for camp. This year they'll be away for six weeks without any parents, homework, city pollution, cell phones, TVs or computers. They are off the grid at camp. I love knowing this. But it also means I can't contact them. That takes some getting used to. As they get older and their tech time and number of devices increases, I am thrilled they will know what life is like without technology for some time. I hope they'll appreciate their friends more, perhaps listen more and take in their surroundings more. They arrived Tuesday morning and I'm guessing they are twitching a bit right now. They're probably reaching into their pockets and feeling for that phone. How do I know? Because I have that twitch too. I am dying to text them and ask how they are. I realize that sending them away to camp gives all of us the independence we need. Speaking of kids and independence, I came across an app that doesn't exactly nurture that. Created for 'busy' parents who want to provide children with independence while knowing what they are doing at all times, I present to you Family by Sygic. You tell me -- is this a practical safety app for parents or helicopter parenting gone to the extreme? One thing I do know is that when your kids are teens, you actually reminisce about those chaotic toddler days wistfully. Human nature is great that way. We remember all the good stuff so we can create an imaginary perfect world to look back on. Maybe that's the thinking behind this hilarious Pinterest page. 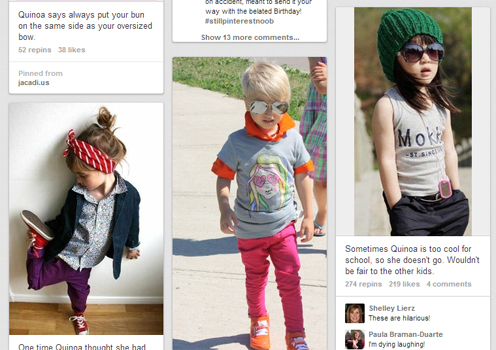 Or maybe it's a spoof on parents gone mad with trendy toddler outfits and names. Either way, it's the funniest thing I have seen on Pinterest by far -- and it's interesting the way it tells a story beyond just the images. Super groovy Quinoa (the toddler) and her entourage of friends, including Jettison, Hampton and Hawkeye (the badass), get up to all sorts of fabulous fun. Enjoy. 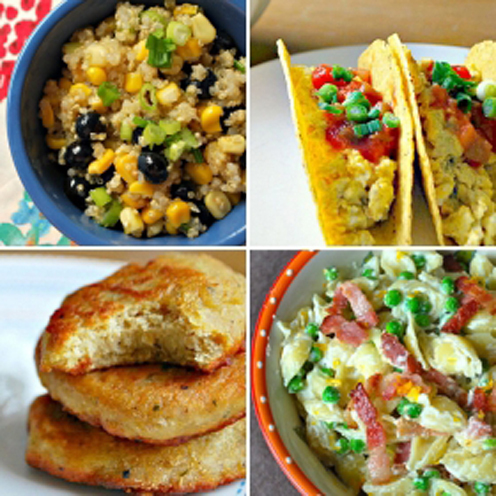 Since toddlers are the flavour of the week, I thought I would draw your attention to our very popular gallery of Terrific Toddler Meals. One of the biggest challenges with toddlers is getting them to eat. Just keep trying new things -- expand your repertoire. I hope this helps. This post originally appeared on SavvyMom.ca. Follow Minnow and SavvyMom on Facebook for more savvy tips and solutions.